"If you can't find clams, use mussels. If someone doesn't care for clams, double up on the shrimp and/or scallops. Baking times may vary according to the ingredients you select." Preheat an outdoor grill for medium heat, and lightly oil the grate. Mix the butter with lemon peel in a bowl. 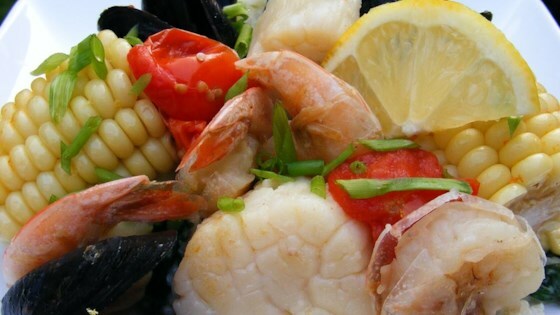 Spread out the sheets of foil onto a flat work surface, and place 4 clams, 4 shrimp, 4 scallops, 4 pieces of corn on the cob, and 4 cherry tomatoes in the center of each piece of foil. Drizzle 1 tablespoon of lemon-butter mixture over the seafood and vegetables. Bring two opposite ends of a foil sheet together and fold over several times to seal. Leave room for steam. Fold the remaining ends over several times to seal the packet completely. Place the foil packets on the preheated grill, cover the grill, and bake until the clams are open and the shrimp are pink and opaque, 15 to 20 minutes (open a packet a little to take a peek). To serve, place a foil packet on a plate, cut a diagonal X through the foil, and peel back the foil. Garnish each packet with about 1/2 teaspoon of chives. Delicious & simple! I didn't melt the butter, just added a little pat to each packet. Also added a sprinkle of Old Ba seasoning to each. I've made this three times in a month!